In this soothing guided imagery program you’ll walk along a quiet lane, and come upon a weathered wooden gate, with a note pinned upon it, written to you. The gate opens onto an enchanted meadow, with a comfortable old chair by a brook. Receive a complete body relaxation, let go of all your cares, and feel tension melt away, with Gateway to Peace. "Imagine you’re walking down a quiet lane. The weather is perfect, and you’re enjoying the steady rhythm of your footsteps as you move along at an easy, comfortable pace. It must have rained here recently, because the air is especially crisp and clear, and you can smell the fresh fragrance of flowers on the gentle breeze. There are tall, old trees along this lane, and you’re enjoying their shade, and the soft rustle of their leaves." "I'm an elementary school counselor and I occasionally have requests from parents to help their children learn some relaxation and deep breathing techniques. So, last spring, I decided to do a "Spa Day" with all the children in my school. I transformed my room into a "spa" with soft lights, soft fragrance, flowing water scenes projected onto one full wall, and soft music. The children loved it. Each class had a 30 - 40 minute spa visit and I led the children through some body stretching and deep breathing, then talked about visualization and let them begin the process of visualizing a favorite place or activity. Then, I played your "Gateway to Peace" recording while I had 25 children laying comfortably on my floor. It was an amazing process to do with Kindergarteners through 5th graders, 350 of them over the course of a week. It wouldn't have been so successful without your recorded journey!" I am especially fond of this piece, because it has some of the elements I most enjoy in guided meditations -- lots of nature, trees, an animal, and a bit of enchantment. I wanted to keep this one brief and to the point, for those times when you don't have a lot of time, and need a quiet inner getaway. 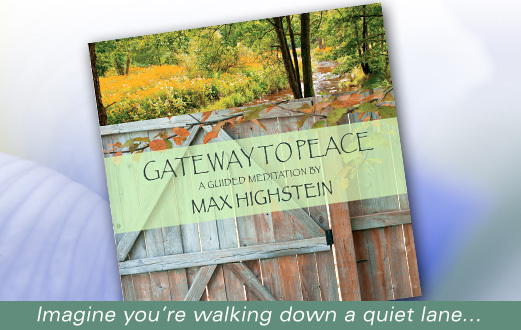 I hope you'll try this new guided meditation, Gateway to Peace, and let me know how it makes you feel.